I've been working on some custom lemming sprites for fun. I'm planning on making some more and will update this thread accordingly, but anyone is welcome to contribute as well! A gloomy, grayscale color scheme to match the atmosphere of the Machine tileset. We have the tileset, now you have the night crawlers themselves for NeoLemmix! We have the tileset, now you have the highlanders themselves for NeoLemmix! 3) In the "theme.nxtm" file of your chosen style change "LEMMINGS default" on the top to "LEMMINGS <style that contains the lemmings folder>" For example: if I download "l2-shadow-lemmings" and put them into "l2_shadow" style folder then my theme.nxtm file will say: "LEMMINGS l2_shadow"
You can now use the night crawling, ninja-like lemmings from the L2 Shadow Tribe in NeoLemmix! See the original post for downloads, previews, and instructions. If an additional sprite for the athlete is covered as well for these in the future, I vote gladly for them both to even become standard! One small disadvantage is that all traps and objects have normal lems in their animations, but zombies have the same problem and because of tileset mixing it's pretty impossible to always have the right colored animation for the Lemming, unless they are all standard. But this is just a very small thing and doesn't bother me that much, as animations are mostly very short anyway. Thanks to Nepster for fixing this bug in NeoLemmix V12... all custom sprites now recolor when you hover over them, when they are zombies, and when they are an athlete. The original post has been updated. You can now use the brave highlanders from the L2 Highland Tribe in NeoLemmix! See the original post for downloads, previews, and instructions. You're really busting them out, aren't you? These are starting to become an incentive to switch to the New Formats version. I am still going to create my next regular pack - Lemmings World Tour - for Old Formats, due to some levels relying on radiation or fake objects, the latter mainly for decoration. (For example, since you mentioned it, I used loads of fake Highland hatches to put barrels into the hold of a ship.) Also because I have created an Old Formats tileset in the meantime which hasn't been completely finished yet, and I would have to convert it to New Formats first for these levels to work. But there will probably be a New Formats version of that pack, too, eventually - once it has enough distinct features to create New Formats-specific levels as replacements for those using radiation. In other words: Once we have at least got the Shimmier, I can start designing those . As a proud Lemminist, I really thought this game needed more "diversity" *, so I made some Egyptian Lemmings ... Probably Nubians, more specifically. The Zombies have a blue-ish grey skin colour, so that they look more like mummies; the traditional grey was too indistinguishable from the regular lemmings in this tribe, at least to my liking. Put these into L2 Egyptian, L3 Egyptian, and anywhere else you'd like to use them! Funnily enough, when these lemmings become athletes, they look pretty akin to the "Acid Lemmings" from Lemmings Revolution. 1) Should their regular appearance be that of Lemmings Revolution Water Lemmings? That means if they're to become swimmers (or any other athlete), they'd have light-blue shirts and white hair. 2) Should their regular appearance be "light blue shirts and white hair", so that they look like Lemmings Revolution Water Lemmings when they are swimmers? I think the only feedback I have is that while I like the mummy appearance of the regular Lemmings, the Zombie Lemmings actually look too "normal" let's say that I easily confused the two of them for a moment. Doesn't bother me though. Thanks, Nessy! It is in fact supposed to be the other way round: The regular lemmings simply have darker skin; the zombies are the ones who look like mummies (i.e. pale). The Underwater tileset was the one I would have suggested pairing the Water Lemmings with anyway, so thanks for informing me! Less work for me then! Wow, good thing I uploaded these before my hard drive crash, otherwise they would have been gone indeed! I mean, this didn't take too much time, compared to the creation of my levels, all of which I could restore fortunately. But still, it would have been annoying to recreate them from scratch, or using my own PNG image to get the exact colour codes! Well, anyway, now I'm back with a new SSD installed, so... does anyone have ideas for how to treat the other L2 tribes? As far as I remember, the Beach lemmings only had a slight tan (or they were supposed to be sunburnt ), meaning more peach skin than completely white. The Polar lemmings had light-blue / grey-ish hair, and dark-blue shirts. And then there's also the enemy lemmings from Lemmings Paintball, of course, meaning red pants and standard green hair. 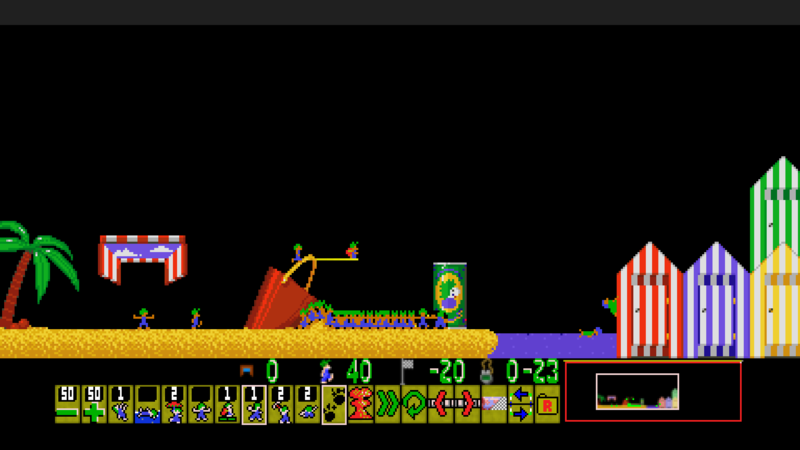 I tried to get as close as possible to the original skin tone from Lemmings 2: The Tribes; sadly, I don't know how to make my old Photoshop 7.0 replace a colour with a specific colour I've selected before. I can only alter Hue and Saturation, i.e. relative to the current colour (not enter specific RGB values, which would be absolute), while having the extracted colour as my selected colour, and then doing a visual comparison. I've updated both my Egyptian and my Beach lemmings sprites to include Nepster's and Raymanni's newly introduced Shimmiers! (See the respective posts above.) I also fixed the Beach splatter in the process, that animation was still lacking the tan for some reason. For simplicity's sake, I've uploaded the entire styles folder for Beach and Egyptian, so that the modified theme- and scheme files are also included. Just drop these into your overarching styles folder and they should work!